Detroit at Chicago White Sox - There's a 40-60% chance of thunderstorms during the game window but Chicago is supposed to get rain for most of the day. It's looking a little dicey at this point so tread carefully and check the weather closer to roster lock. Miami at Colorado - There's a decent chance of rain at the beginning of the game (40-50% chance) but the rain chance diminishes significantly as the afternoon proceeds. I think there's a chance this game is delayed but I think it should get in. Johnny Cueto vs San Diego - Pitching at home, Johnny Cueto is a really nice option against the Padres on Sunday. Cueto has always been a better pitcher at home than away but the split differential has been even more stark this season with Cueto posting .219 wOBA at Great American Ballpark and .337 on the road. The Padres have a 21.6% strikeout rate against RHP this season (7th highest in the league) and over the last week they have just a .111 ISO as a team. Gerrit Cole @ Atlanta - Cole's home/away splits are pretty even throughout his short career but he has been marginally better on the road than in PNC park. The Braves don't strike out a lot against right-handed pitching (just an 18.1% K rate) but their wOBA vs RHP is just .305 and their ISO is the 4th lowest in the league at .120. Cole hasn't allowed more than 3 earned runs in any start this season and has given up 2 or fewers earned runs in 9 of his 11 starts this season. Carlos Carrasco vs Baltimore- Baltimore strikes out A LOT against right-handed pitching (22.9%) and Carrasco has a 29% strikeout rate with a 1.71 ERA over his last 3 starts. 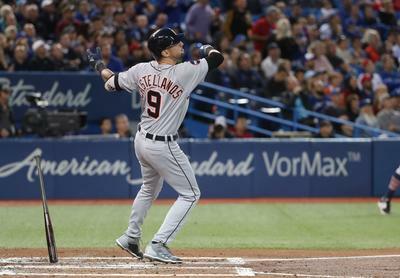 I think he might be overlooked quite a bit on Sunday but he's actually a really nice play with the Orioles struggling to generate offense over the last week (slashing .219/.277/.332 as a team). Chris Archer @ Seattle - Another team that generates a lot of whiffs against right-handers is Seattle. Archer has been elite on the road this season but for his career his home/away splits are pretty even. While the Trumbo addition makes their lineup stronger, neither he nor Cano have really gotten it going this year and with Nelson Cruz coming back down to earth, I think Archer is in a great spot. Oh yeah, did we mention that he has 27 strikeouts over his last 16 innings pitched included a 8 inning, 2-hit performance against the Mariners two starts ago. Since he has been so hot, I think his ownership levels will be a little inflated. I think he's a great option but I'm not sure I like him better than Cueto or Cole. Jordan Zimmermann vs Chicago Cubs - The Cubs lead the league in strikeouts against right-handed pitching so Zimmermann pitching at home is an excellent choice. Zimmermann is a master at limiting damage and if you take out his second start of the season at Boston, Zimmerman hadn't allowed more than 3 earned runs in any game since July 2014. He'll provide a bit of salary relief but still carries nice point potential in a 50/50. Due to the limited overall ceiling, I'd look to Archer or Carrasco in tournaments. **I don't love Zack Greinke against the Cardinals today. Given his price point, the Cardinals success against RHP, and Greinke's reverse home/away splits, I'm fading him today. Alex Wood vs Pittsburgh - The Pirates are absolutely terrible against left-handed pitching (23.9% K rate and .294 wOBA) and while Wood doesn't have huge K upside, he's allowed just 3 ER over his last 3 starts and is a great option on DraftKings as a second pitcher. Mike Fiers vs Minnesota -With a favorable park shift, Mike Fiers is in play on DraftKings and other two pitcher sites facing a Twins lineup that doesn't hit right-handers very well (.294 wOBA and 21.7% K rate). Buster Posey vs Sean O'Sullican- Posey with a favorable park shift? Sign me up. Posey has a .359 wOBA against right-handed pitching and O'Sullivan is very homer prone. Posey is an above average hitter against all three pitches that O'Sullivan throws (fastball, slider,change) and while he's expensive, $3,800 and $4,300 is actually pretty reasonable for a hitter of his caliber. Chris Iannetta vs CC Sabathia - It's not often that Iannetta gets to face a left-hander but he gets that opportunity on Sunday, with a favorable park shift nonetheless! Iannetta has an .868 OPS and .378 wOBA versus left-handers since 2013 and CC Sabathia has an .839 wOBA versus right-handed batting. Kevin Plawecki vs Josh Collmenter - He's not necessarily a great hitter but at near minimum priced, Kevin Plawecki is a solid punt play at the catcher positon thanks mostly to a nice park shift from New York to Arizona. JT Realmuto vs Kyle Kendrick - Another catcher I'm happy to punt with (at least on FanDuel, $4,100 on DK is hardly a punt), is JT Realmuto against the homerun prone Kyle Kendrick. Realmuto has been hitting well lately with back-to-back extra base hit games and 4 hits on Friday. Miguel Cabrera vs Jeff Samardzija - Miggy's day vs night splits have been exaggerated this season, with him having an incredible 10 of his 11 homeruns coming during the day with a .419/.495/.817 slash line. Tomorrow Miggy faces the suddenly homerun prone Samardzija and at $4,800, he's pricey but not too pricey to sacrifice the rest of your lineup. Paul Goldschmidt vs Jacon deGrom - If price were no object, Paul Goldschmidt would be one of the best plays of the day regardless of position. If there'sone area of deGrom's game where he struggles, it's when he moves away from Citi Field and pitches in friendly hitters parks. Early this season, deGrom allowed 3 HR in Yankee Stadium and 2 HR in Wrigley and now goes to the second most homerun friendly park in the league. Goldy has been swinging a hot bat with 4 HRs over the last week but he's going to really hurt the rest of your lineup if you pay up at $5,700 on FD and $5600 on DK. Prince Fielder vs Jeremy Guthrie - Left-handed batters are Jeremy Guthrie's worst nightmare (.872 wOBA vs LHB since 2013) and Prince Fielder's price is all the way down to $3,800 on FanDuel and $4,800 on DraftKings. Fielder is a really strong slider hitter and Guthrie throws a heavy dose of them. He has a .366 wOBA and .846 OPS against right-handers since 2013. Lucas Duda vs Josh Collmenter - My favorite value play of the day is Lucas Duda. Collmenter struggles against left-handed batters and Duda crushes righthanded pitchers. Sounds like a match to me. At $3,600 on FanDuel and $4,800 on DraftKings, he's a great value. Duda has a .379 wOBA and .876 OPS against right-handed pitching since 2013. Brandon Belt vs Sean O'Sullivan - After getting on a nice roll the last two weeks, Belt has gone cold the last two games in Philly. Fortunately, he's still priced moderately around the industry and I really like the righty/lefty matchup he draws against Sean O'Sullivan tomorrow. Note: Joey Votto, Adam Lind, and Freddie Freeman are all nice value plays due to their righty/lefty splits but they both face heavy groundball pitchers. I generally don't like to target hitters against groundball pitchers but they could be decent tournament options. Jason Kipnis vs Bud Norris - All of the Indians left-handers are in play against the righty Bud Norris. KIpnis has been the best second baseman from an offensive perspective this season and is the most productive against sliders. Norris throws a heavy dose of fastballs and sliders and even though he's expensive, especially on FanDuel, he's the clear cut best option at the second base position today. Logan Forsythe vs Mike Montgomery - The Rays face yet another lefty on Sunday and Forsythe remains a great value play hitting 4th in Tampa's batting order. On DraftKings, he's particularly valuable at only $3,400. He's averaging 1.74 fantasy points per plate appearance on DraftKings against right-handed pitching since 2013. Dee Gordon vs Kyle Kendrick - I can't justify his enormous price tag of $5,500 on DraftKIngs but at just $3,900 on FanDuel, I absolutely love him as a value play. There should be a lot of runs being scored by the Marlins on Sunday against Kyle Kendrick and Gordon should have ample opportunities to score those runs. Joe Panik vs Sean O'Sullivan - If you haven't caught on yet, I really like a lot of the Giants lineup on Sunday considering their reasonably low price point and favorable pitching environment. Panik has been on a tear lately and at just $3,200 on FanDuel and $3,800 on DraftKings, he's a tough value to pass hitting 2nd in the Giants batting order in a game with a game total of 8.5 runs. Nolan Arenado vs Jose Urena - With a projected game total of 11 runs, I want as much exposure to these two lineups as I can. Arenado is good against right-handed pitching, but not elite, and he's been hitting the ball really well. Playing him is more about stacking the odds in your favor with a high game total, nice hitting environment and a weak opposing starting pitcher. Evan Longoria vs Mike Montgomery - The Rays get another lefty and as always, any time Longoria faces a left-handed pitcher he must be considered. Longoria has a .892 OPS and .377 wOBA against left-handed pitching since 2013. Kris Bryant vs Jordan Zimmeramnn - Kris Bryant is a great price on DraftKings ($4,200) and while he faces a good pitcher in Jordan Zimmerman, we all know what Bryant is capable of at this point. He's been an excellent hitter against both sides of the plate but the majority of his power has been generated against right handed pitching (.188 ISO). Joey Gallo vs Jeremy Guthrie - An all-or-nothing power hitting lefty against a pitcher who loves to give up homeruns to lefties? What's not to love, especially at a $3,200 price on FanDuel and $3,500 on DraftKings. Without a penalty for outs, Gallo is particularly enticing on DraftKings. Chris Davis vs Carlos Carrasco - On paper, Chris Davis is exactly the type of guy you want to play today. He is pretty reasonably priced at $3,200 on FanDuel and $4,000 on DraftKings and he gets to face a right-hander. However, I'm a little nervous about the way the Orioles are playing and Davis has looked a little lost at the plate. On top of that, Davis has a really high strikeout rate and Carrasco is a big time strikeout pitcher. Given the nice matchup on a historical basis, he's a nice tournament play but he's too risky to deploy in a cash game. Troy Tulowitzki vs Jose Urena - He's prohibitively expensive and he sometimes gets days off on Sunday but if he's in the lineup Sunday, he must be considered. The projected game total is 11 runs and what's a Rockies stack without Tulowitzki? Brandon Crawford vs Sean O'Sullivan - O'Sullivan has allowed left-handed batters to have a .509 wOBA and 1.235 OPS against him to begin the year. Crawford has cooled down considerably since his hot streak several weeks ago but he still gets an excellent matchup and a nice park shift on Sunday. Jose Iglesias vs Jeff Samardzija - Iglesias is a hit machine that doesn't possess a lot of power or speed and usually hits at the bottom of the batting order yet is a consistent contributior in the daily format. He's minimum priced FanDuel at $2,200 and just $3,100 on DraftKings. He'll provide great salary relief on a day were you're going to want to pay up for some of the offenses. Giancarlo Stanton vs Kyle Kendrick - For the third day in a row, Giancarlo Stanton is the top play of the day. Today he gets Kyle Kendrick, the same pitcher who has allowed 15 home runs in his first 11 games of the year. Stanton gets one of the best park shifts in the league, moving from Miami to Colorado for today's game. He's expensive but he's nearly a must-have in your lineups. Mike Trout vs CC Sabathia - I usually hate recommending Mike Trout because I usually feel like it goes without saying he's always a great option. However, on Sunday I think he's actually worth clearing some salary to pay for against CC Sabathia is a great hitting environment in New York. Sabathia has allowed right-handers an .839 OPS since 2013 and Trout has a .402 wOBA and .924 OPS against lefties. Joc Pederson vs Lance Lynn - I'm deploying the lefty Joc Pederson against Lance Lynn on Sunday. While he's quite a bit more expensive than last week when he was my recommended value play (he's $4,100 on FanDuel & DraftKings), he's a great option against Lance Lynn who struggles while pitching on the road. Pederson has a .924 OPS against right-handed pitching this season. Carlos Gonzalez vs Jose Urena - Sticking in Coors, Carlos Gonzalez is a nice play against the Marlins Jose Urena who has allowed 2 homeruns over his 2 starts and 8 total earned runs over that time frame in two very pitching environments (Miami & Pittsburgh). Now he moves to the worst pitching environment in baseball and that makes the left-handed CarGo a fantastic play. Starling Marte vs Alex Wood - It's not necessarily ideal considering Wood's groundball tendencies but Starling Marte is in a great spot. Since 2013, Marte has a wOBA of .420 and an OPS of .969 against LHP. At only $3,900 on FanDuel and $4,400 on DraftKings, his price has fallen but remains an elite option. Christian Yelich vs Kyle Kendrick - Despite the really favorable park shirt, Yelich is still decently affordable on FanDuel ($3100) and but a little too inflated on DraftKings ($4500). He faces the homer prone Kendrick and while he hasn't exactly been hitting recently, he's one of the best pure hitters in the game and he hits right-handers very well with a .341 wOBA over the last 3 seasons. Andre Ethier vs Lance Lynn - Andre Ethier is always in play against right-handers but he's quite cheap at $2,600 on FanDuel and $3100 on DraftKings and faces a pitcher in Lance Lynn who struggles mightily on the road (.343 wOBA on road vs .276 at home). Michael Cuddyer vs Josh Collmenter - Cuddyer is working on a 10 game hit streak and he has hits in 15 of his last 16 games. On top of his, he moves from the large Citi Field to the cozy Chase field and faces Josh Collmenter, a guy who has given up 9 home runs in 11 games this year and 76 hits in just 62.2 innings pitched. Cuddyer is just $2700 on FanDuel and $4100 on DraftKings. Angel Pagan vs Sean O'Sullivan - At minimum priced on FanDuel and dirt cheap on DraftKings ($3,600), Pagan is a nice punt play in the outfield, especially if he draws the 3rd spot in the batting order where he has been hitting. Pagan mght not possess the most power in the world but he's a good hitter against sliders (3.11 wSL/c) and O'Sullivan throws sliders 20% of the time, his second most frequently thrown pitch.